Arsene Wenger: "I looked at the comparisons, our cheapest prices are cheaper than anywhere in London." 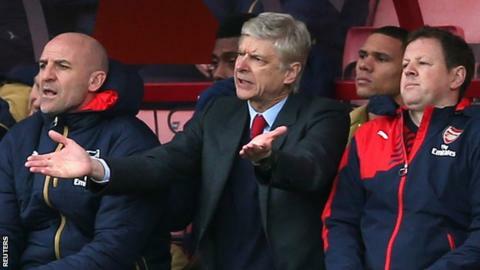 Arsenal boss Arsene Wenger wants fans to cancel protests set to take place during Sunday's game against Leicester. Foxes fans, who are upset at the late switch in date and kick-off time, plan to enter the Emirates Stadium five minutes after the match has started. The ploy has been backed by Gunners supporters, but Wenger says everybody should be in their seats on time. "You can protest before and after but during the game you want everybody to be there," said the Frenchman. Arsenal v Leicester: Is this the Premier League title decider? The fixture was moved on 21 January, from Saturday (15:00 GMT) to Sunday (12:00 GMT), so it could be broadcast live on television. Leicester supporters say the late switch has cost them money on travel and accommodation booked before the alteration. But Wenger urged spectators not to miss "a moment of happiness". "Life is not every day fantastic," he said, "Sometimes it's boring, sometimes it's difficult for many people. "Football is a moment of happiness in your life, so don't miss it." Arsenal supporters' group REDaction has called on home fans to join in the protest by applauding the late arrivals into the stadium. Wenger has also defended Arsenal's ticket pricing again. Last week, he said that extra television revenue for top-flight clubs, which starts flowing in from next season, should be used to buy players rather than cut ticket prices. This week, he said the Gunners offered good value for money. "It is a very complicated subject," he said when asked for his latest views on the ongoing row over ticketing. "Our most expensive price is a fraction higher than the other clubs in London. Our most common ticket price is lower than many places in England. I don't think that we have a massive problem on that front." He said it was "true we get more television income" than other leagues but said there was pressure to "pay for the players with a higher price". He added: "You want the ticket prices to be as comfortable as possible for our fans. Our cheapest prices are cheaper than anywhere in London." What do other clubs think? Stoke City have frozen ticket prices for eight seasons following their promotion to the Premier League. Club chairman Peter Coates told the BBC: "We wanted prices to be affordable. It's a working men's sport and that's where its roots are. "We haven't raised ticket prices. The amount of income we get from TV rights, we can afford to do what we do." Liverpool have been in the news this week following plans to increase the cost of its most expensive matchday ticket to £77. The club eventually decided to abandon the price hike after fans staged a walkout last weekend. Reds boss Jurgen Klopp said the owners made the U-turn because "they really care about the club and the interests of supporters".